Oded Shoseyov’s lackluster grades failed to get him into the undergraduate chemistry program at the Hebrew University of Jerusalem. So he audaciously persuaded a committee of professors to take a chance on him. It was a good gamble: He would later become a professor of protein engineering and nano-biotechnology at the same university, and one of its most prolific inventors and serial entrepreneurs. Shoseyov, now about to found the 12th company spun out of his research, has a knack for turning crazy concepts into commercially viable products such as printed meals, human collagen, transgenic eucalyptus trees for the paper industry, and a pooper-scooper that turns dog droppings into odorless powdered fertilizer. “I wasn’t a particularly good student but I was always curious about science. As a kid, I had a chemistry and electronics lab and I built things with my brother,” Shoseyov tells ISRAEL21c from his lab at the Robert H. Smith Institute of Plant Science and Genetics at Hebrew University’s Rehovot campus for agriculture, food and environment. He is the eighth generation of his family in Rehovot, a city of 150,000 about 20 kilometers south of Tel Aviv. A major academic and biotech hub, Rehovot also has a rich farming tradition. The name of the winery pays homage to its founding partner, Hebrew University Prof. Ben Ami Bravdo, a leading scientist of modern viticulture under whom Shoseyov studied for his PhD on the biochemistry of wine and grape flavor. After a post-doc at the University of California at Davis in 1987 to 1990, Shoseyov accepted a position with Hebrew University’s Faculty of Agriculture and founded its first protein-engineering lab. For the past 15 years, Shoseyov has focused on nano-biotech, especially nanocellulose. This lightweight transparent nano-fiber is stronger than steel and has infinite potential as the basis for super-durable fabrics, shoes, touchscreens, packaging, paints, buildings, medical implants and much more. It’s derived from plant cellulose, a polysaccharide (sugar) that is the most abundant polymer on earth. “Cellulose is everywhere,” says Shoseyov, whose first breakthrough back in 1993 was developing and cloning a protein that binds to cellulose in order to create composite materials. At that point he was naively ready to publish a paper before patenting his invention. Luckily, he mentioned this during a casual lunch with George Aaron, cofounder of an Israeli-American pharmaceutical company for which Shoseyov had done some consulting. Alarmed, Aaron put down his fork and phoned Yissum, Hebrew University’s tech-transfer company. He hastily arranged to get Shoseyov’s protein patented before the paper was published, gave the budding scientist $150,000 to do a proof of concept, promised him 4% equity in a commercial venture based on his invention, and asked Yissum to negotiate any licensing agreements. “We didn’t even write the agreement on a napkin but they fulfilled it,” says Shoseyov. CBD Technologies, the protein-engineering company founded in December 1993 as a result of that café conversation, merged with FuturaGene 13 years later and was sold for $100 million to Brazilian paper company Suzano in 2010. The R&D center remained in Rehovot Science Park. 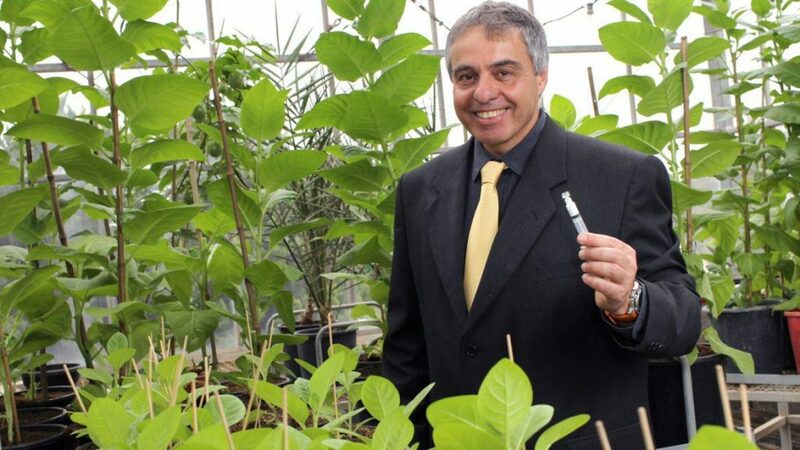 “It was the first commercial transgenic tree ever approved,” says Shoseyov. “I realized it was one thing to do research and publish a paper but we can find ways to use the data for economic benefit. So I’ve done that now more than 10 times,” he tells ISRAEL21c. Another offshoot of his university laboratory is regenerative medicine company CollPlant. Recombinant human collagen fibers extracted from Shoseyov’s proprietary transgenic tobacco plants are six times tougher than the body’s own tendons and ligaments. CollPlant’s first two CE-approved products are for healing diabetic foot ulcers and treating tendinitis. “We have now developed a bio-ink based on our collagen that is suitable for use in 3D printing, ”Shoseyov reports, and he has collaborations in place to develop 3D-printed human corneas, kidneys and lungs. Meanwhile, Shoseyov is establishing his 12th company, Chef-it, with fellow Hebrew University Prof. Ido Braslavsky. The Chef-it computerized platform enables 4D printing and cooking of personalized meals using ingredient cartridges including one containing calorie-free nanocellulose fiber as a self-assembling binder in place of starch, eggs, gluten or gelatin. A wide variety of dishes can be baked, fried or grilled, and tailored according to taste preferences and dietary restrictions. Printed and cooked layer by layer, they can take virtually any form. In about 18 months he hopes to have beta sites up and running in Israeli workplaces. Hospitals and restaurants may follow. In the future, he envisions individual Chef-it users programming the machine to prepare food in time for the kids to come home from school. “You could use a smartphone app to send a print command to each of your children to order exactly what they want and need for their personal diet and taste,” he explains. There’s no question those chemistry professors at Hebrew University are happy they accepted Oded Shoseyov in 1978. His first year of university, after his service in the artillery corps, Shoseyov made the dean’s list. He has won several awards, authored or co-authored more than 180 scientific publications, invented or co-invented 50 patents, and was recently chosen by the Founders Studio for its “70 by 70” feature saluting outstanding Israelis. In addition to overseeing the 20 graduate students in his lab, teaching classes and maintaining an active role in his businesses, Shoseyov enjoys running, mountain biking and singing in a quartet. “My inspiration is Leonardo da Vinci, the most interdisciplinary scientist ever — a chemist and medical doctor, engineer and artist,” says Shoseyov, the father of a daughter and two sons from his first marriage and stepfather of two daughters with his present wife, Yaeli Pintchuk, a psychologist specializing in eating disorders. Other nanotech companies Shoseyov helped found are SP Nano, Melodea(nano-crystalline cellulose from paper sludge for structural foam, composites and adhesives), Valentis Nanotech (nano-bio-based transparent films for food packaging and agriculture), Paulee CleanTec (transforming pet and human waste into sterile powdered fertilizer), GemmaCert (fast cannabis plant analysis), Biobetter (producing therapeutic antibodies on tobacco plants), Cannabi-Tech (standardization tools for medical cannabis products) and BondX (environmentally friendly bio-additives for the paper industry). He also serves on the boards of PlantArcBio and UBQ Materials. Most of his firms’ offices are in Rehovot Science Park. At the two companies headquartered in the North, he delegates more of the responsibilities. According to Mr. Shoseyov, a professor of plant molecular biology, protein engineering and nano-biotechnology at The Hebrew University in Jerusalem, Chef-it can imitate the flavor effect of different cooking styles, such as grilling, baking, and frying. A prototype of this machine, located at the Hebrew University’s Faculty of Agriculture, Food and Environment in Rehovot, in central Israel, currently takes 10 minutes to print a single burger, Mr. Shoseyov told Calcalist in an interview Tuesday. Chef-it’s team is hard at work bringing the printing time down to three minutes, he added. The company’s first target markets include coworking spaces, offices, and food trucks, Mr. Shoseyov said. 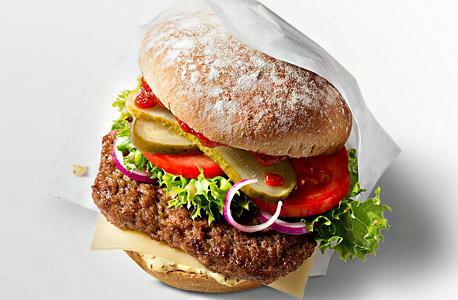 The company successfully printed its first burger six months ago and is expecting to hit the market within two years. A fast and convincing alternative to meat, Chef-It is setting out to deliver products that are environmentally-friendly and potentially healthier than traditional processed foods. Cellulose, Mr. Shoseyov says, has a zero glycemic and caloric value. Along with Scientific co-founder Ido Braslavski, Mr. Shoseyov began the research behind Chef-It’s technology in 2013. In 2016, the company received a $282,000 (NIS 1 million) grant from Israel’s government innovation investment arm. Currently employing a team of eight, the company is in the process of raising a $2 million funding round, which Mr. Shoseyov said is expected to complete within two months. The global meat industry is ripe for disruption, being one of the world’s biggest polluters, generating as much greenhouse gas emissions as all of the world’s cars, trucks, trains, ships, and airplanes combined, and using 30% of all land and over 25% of all freshwater on Earth, Mr. Shoseyov said Monday speaking at a Food and Tech conference. The conference was hosted by Calcalist, and by Israel’s Bank Leumi at Labs TLV, a co-working and events space in central Tel Aviv. By using cellulose as a malleable binder, Chef-It could potentially print every type of food known to men, and even invent new foods, Mr. Shoseyov said. As a first target, the company set out to print the perfect its burger. By utilizing adjustable infrared cooking levels the company hopes it can get it just right. “We are a few months away from delivering a burger that is indistinguishable from the real thing,” Mr. Shoseyov said.